Meet Teresa, one of our travel experts for Kenya. Teresa Sullivan has been traveling and planning safaris in Africa for the last 15 years. She is one of the founders of Mango African Safaris. Mango Safaris specializes in the finest tailor-made safaris, honeymoons and holidays throughout East and Southern Africa and the Indian Ocean islands. Whatever your African dream may be, Mango Safaris can customize an adventure to suit your taste, budget and travel style. Loisaba is a 61,000 acre private ranch and game sanctuary and is popular for its diverse range of activities – lion tracking, camel safaris, quad & mountain biking, river rafting (not white water! ), spectacular helicopter safaris, night game drives, fishing, the list is endless! Photo copyright Cheli & Peacock. Guests enjoy complete freedom to choose how they spend their time so the only barrier is their own imagination. Trek through the bush with camels, mountain bike down the escarpment, raft, horseback ride or drive through the wild canyons of the two great rivers that span the vast property. Pros: With just a couple of villas on this enormous piece of private land, you won't feel crowded by any means. Communal dinners in the main lodge are a wonderful opportunity to recount your days' adventures (as each group of guests will be on their own adventure). Coffee on your deck overlooking the watering hole each morning is an amazing experience--you'll likely see a dozen species at the watering hole at once. Don't pass up the opportunity to spend a night in the Star Beds, which are maybe a 1/2 hour drive from the main lodge. 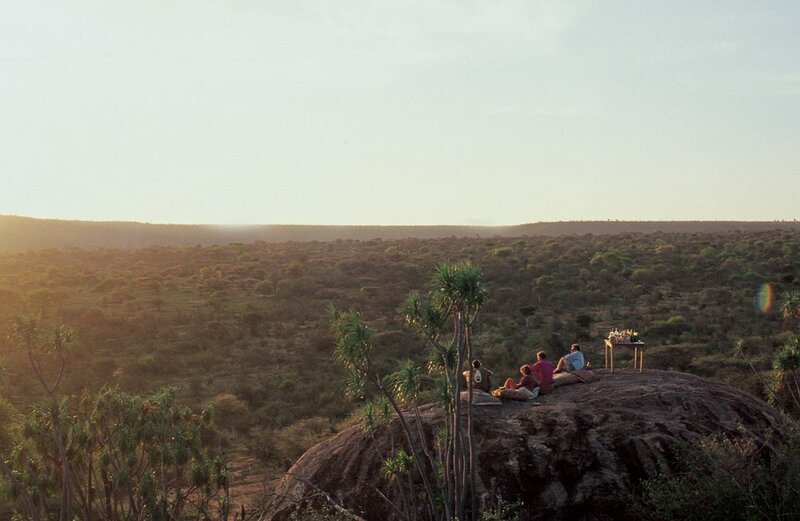 You'll have an incredible dinner cooked over an open fire, and then sleep in a comfy bed on a raised, open-air platform while Samburu warriors stand guard a few dozen yards away with their spears...listening to the animals call to each other. Make sure you visit the Samburu village that the lodge helps support--that will be an experience of a lifetime, for sure.